This page contains all the answers to those burning questions I get asked on a nearly daily basis from Green Acres fans. However, before I just give you the answers, I'd like to pick your brain for a few answers of my own. As big a fan as I am of the show, occassionally, even I get a question that I can't answer. Here's your chance to help me out! If you know the answer to any of the questions below, please email by: clicking here. Do you remember an episode where Mr Kimble said he owned the town signed papers that he does not own the street but owns the land under the street His neighbor may also own the street, well at least part of it. His neighbor pays his taxes and he pays his neighbors taxes. Then he went into a ramble how this was filed under that category in the town records, everything was a paperwork nightmare totally disorganized, but he knew the chaotic luny system of how the town misfiled the records. I watched Green Acres as a kid and always enjoyed it. I particularly remember a funny episode where Oliver mentions growing rutabagas, and everyone tells him there's no such thing and this joke is brought up several times throughout the episode. I searched for Rutabaga and Green Acres and could only find Season 3 episode 27, but in this episode everyone agrees that rutabagas exist. I've even searched Petticoat Junction, to no avail. Do you know what episode includes the line: "There's no such thing as a rutabaga"? I am trying to find the name and episode number of the show in which Mr, Drucker is recommending after shave lotion to Arnold and tells him that it is what he uses on dates. Arnold snorts and Mr. Ziffel explains that Arnold has seen the girls that Mr. Druker dates and if that is the after shave lotion he uses, then Arnold wants something else. Can you tell me what episode has Mr. Haney saying the following (referring to used car): "it's never been wrecked, raced or abused, driven uphill or against the wind?" What was the brand of hat that Hank Kimball wore? Could you tell me if Oliver and Lisa's bedroom was ever decorated in red? What is the china pattern that was used on Oliver and Lisa's table in Green Acres? What is the brand/style of the chaise lounge in the kitchen and also what is the brand/style of the red velvet chairs around the glass table? What Brand/Style are the crystal wall sconces, one of which hangs on the same wall of the penthouse as the Mondrian painting. Also what brand of chair is the orange chair that is below the crystal sconce. What kind/brand of chairs are the ones that are in the corner behind the leopard skin couch, also what kind of paintings are the ones that hang above the orange chairs that I mentioned before and, one more thing what kind/brand is that silver cabinet with the Asian markings on it. I seem to remember, Lisa was trying to home-process (�can�) corn. She would take one ear of corn and put it in a mason jar and cook it. Do you remember this episode or am I dreaming??? Could your please tell me the "Brand Name" and/or the name of the "Tea Pots" or "Coffee Pots" that hung in the back of Mr. Drucker when he would be standing at the counter talking to all his customers during the show? In what episode did Mr Ziffel talk about his gasoline-powered TV set? I'm a semi-new Green Acres fan. I remember watching the re runs of it with my Mother several years ago but recently just started watching again. I can't help but notice the pink appliances in their house on the show. Would you happen to know what brand they are? Hi, I was wondering if you knew who got 3rd place in the shuffleboard game on one of the green acres episodes. they said arnold won, Lisa got second. What was the western movie that�Arnold was always watching on TV? I recall a scene in an episode were Lisa explains the rules of baseball � I think it was to Eb Dawson...What episode was it? And what was her explanation? What is Arnold's favorite food? Which episode does Mr. Haney say "whompata whompata ping" when describing a malfunctioning motor? The actual location of Hooterville was one of the many running gags of the show. It was never disclosed as to what state Hooterville was supposedly in. Frequently, the writers would put conflicting "hints" into the episodes to further confuse viewers. What was Lisa's dog's name? Lisa's dog's name was Mignon (as in filet mignon...pronounced MEEN-yohn). Mignon was a female Yorkshire Terrier. In French, "mignon" means "nice" or "cute." What is Mr. Haney's first name? What channel is Green Acres on? Although if you look hard enough, you can usually find SOME channel that shows Green Acres, why not just head over to Hulu.com and watch ANY episode that you want whenever you want...Thanks Internet! What cast members are still alive? Are Green Acres episodes available on DVD? Yes! MGM has put out several seaons on DVD (Three seasons as of 4/29/2006). The DVDs ares GREAT! Complete, uncut, and in order! To purchase the DVDs, click here. Unfortunately, it appears that MGM is dropping the ball and will not be releasing seasons four, five, or six. Are Green Acres episodes available on video tape? Yes, many years ago Columbia House put out something like 20 tapes through their video club. Unfortunately, they didn't release all of the episodes, and the episodes on the tapes are in NO particular order, whatsoever! You can usually find them on Ebay. Can you give me so-and-so's address so I can write them? No. I do not know how to contact most of the people connected with Green Acres. The one's that I do have any connection with have not asked me to make their information public, so until they do, I'm respecting their privacy. The ONLY exception to this rule is with Tom Lester. He has a website where you can send him personal messages. Only use regular mail though...he never checks his email. His site is at: www.gollymisterdouglas.com. Be sure to tell him Mark Maggiore sent you! Did the Green Acres ever do a crossover with Petticoat Junction or the Beverly Hillbillies? Yes. There were tons of little crossover shows where Green Acres cast members would show up on Petticoat Junction or The Beverly Hillbillies, and vice-versa. My personal favorite pseudo-crossover is when the Hooterville theatre troop performed an Episode of The Beverly Hillbillies with Oliver as Jethro and Lisa as Granny. What episode featured the Hooterville Monkey Racing Track? That would be episode #139. The case of Hooterville refund fraud (first aired 02/28/70). Who directed all of those kooky episodes? What was the cow's name? What was Arnold's favorite TV show? Although he always seemed to be watching cowboy and indian pictures, his FAVORITE show was actually the soap opera "Love is never a stranger." What was the telephone operator's name? What brand of tractor did Oliver own? On the show, his tractor was a Hoyt-Clagwell. In reality though, his tractor was a Fordson model "F" built from 1917-1926 . This was the first actual tractor built and sold by Henry Ford (Ford Motor Company). It was named "Fordson" because of the involvement of his son in this venture. Ford Motor company was a sponsor of the show, thus his car being a Lincoln, Haney's truck a Model "T",and the Fordson. If you remember the show when Lisa bought Oliver a new tractor, the tractor dealer had all Fords, and I believe the tractor she picked was a Ford 6000 diesel. These were built from 1961-1967. The other tractor used at the beginning of the show start was a John Deere "GP" tractor. The "GP" stood for General Purpose,and these were produced from 1928-1935. The McCormick-Deering tractors were #1 in popularity back when these tractors were built, and John Deere was second in line. The three companies engaged in price battles for sales dominance, in which McCormick-Deering came out on to with Deere second, and Ford finally dropped production of the Fordson "F" in retreat. I would guess that the "GP" was his liking, but because of Ford's sponsorship, the Fordson was a requirement. What was Lisa's maiden name? What was the dog's name that was on both Green Acres and Petticoat Junction? Admit it! One of the reasons you tune into the show is to see Higgins, the top dog at the Shady Rest Hotel. That's why I get so many of you asking questions about the dog, from it's name, to how it did those tricks. First of all, let's tackle the name issue. On the show, the dog was called simply "Dog". Though in one episode Gunilla Hutton messed up and spoke his real name, Higgins, which was either never caught or let go. In any event, that one blooper is probably the reason for the controversy. Do you know what railroad the "C&FW" stands for? The most unique "character" in the Petticoat Junction cast is The Hooterville Cannonball, an abbreviated steam-driven train run more like a taxi service by its two engineers, Charley Pratt and Floyd Smoot. It is not uncommon for the men of the Cannonball to make an unscheduled stop in order to go fishing or pick fruit for Kate Bradley's menu at the Shady Rest Hotel. Occasionally, Betty Jo Bradley can be found with her hand on the Cannonball's throttle, as driving the train home from trips into town is one of her favorite pasttimes. The train was also used in some movies, like "Ticket to tomahawk" w/Dan Dailey & Ann Bancroft (I think) and a young Marilyn Monroe in one of her first roles. It was made sometime in the 40s, but I don't know when or what other movies it was in. Also, it only had one set of driving wheels (the big wheels) and they had to switch them around sometimes, depending on what side was toward the camera. Which show came first? Green Acres, Petticoat Junction, or The Beverly Hillbillies? I have a question about the opening credits of green acres. Do you know where the footage of the farm and the farm house (With the Green Acres painted on the roof) was taken? The opening credits, including the farm house with the title on it, were shot in Thousand Oaks, California. The title was painted by Max Thornton. The ACTUAL Green Acres house (Where Lisa and Oliver lived), however, was only a sound stage. What was the name of Eb's friend, the scarecrow? Actually, there have been a couple of names. Perhaps there was more than one scarecrow. The one's I've found so far are Dudley, Carl, Wilber, and Stuffy. Who owns the rights to the theme song? How can I use it in a commercial? Vic Mizzy wrote the theme song. It is available for commercial use. For complete info, contact: Monica Corton, VP of Creative Affairs & Licensing for Next Decade Entertainment, Inc., 545 Madison Avenue, 6th Floor, NY NY 10022. Phone is 212-583-1887. Fax is 212-813-9788. E-mail is nxtdec@aol.com. How can I save the radio shows (and other such sound files) to a CD? To record these shows to cd, first download them and put them in a folder or somewhere where you can find them later. Perhaps on the desktop. You may want to right-click and rename them so that you can distinguish one show from another. Of course, you will need a computer with a cd burner. (What if you don't have a computer with a cd burner, or you simply prefer cassette? Theoretically, one should be able to record anything playing on the computer by connecting the computer's speaker output jack to a portable cassette recorder's input jack. In that case, you will not need to convert these files, you simply need to play them.) Then, download a free program called "jetAudio 5 basic". This will play these .rm (RealMedia) files. It will also convert them to .wav files, which is necessary to record them. Use the "open files" button on the toolbar to play it. You should hear the show playing. If you click on the time and choose "remained time", it will come in handy later. It will count down rather than up. Stop playing the show. Click "recording" on the upper bar (you will not need to click on "conversion" at all). A new window will open. On the source side, choose "mono mix". Set your record levels. I used the following; shows 1 & 2 - level 10. For show 3 - level 8. For show 4 - level 3. You can experiment for yourself by "recording" (or converting) a few samples and watching the volume levels. Going in the red a little bit is OK. "Recording", which I would call converting, is done in real time. In other words, a half-hour show will take a half-hour to "record" (or convert). On the target side of the "recording" window, choose the folder where the "recorded" (or converted) files will go, and choose WAV under "encoder". I don't know what "File Naming" does. Under "option", you may want to check "enable timer" and set the time for 30 minutes. That way, if your not around to stop the "recording" (or converting), it will stop automatically. You don't want to let the "recording" (or converting) go on too long after it's done, because it will cause a gap of silence between your first and second track on your cd. Set the timer, but try and stop it manually when the show is over. When you are finished with the show, find the file you just made, right-click on it and rename it. If you don't, each new "recording" (or conversion) will overwrite the previous one. I named mine "7-10-50", "7-17-50", and so on. The hard part is now done. Now all you have to do is burn your cd's with the newly created .wav files, using Windows Media Player, Roxio, or whatever you normally use to burn cd's. You can fit 2 shows per cd. Who created all of Lisa's great outfits? Jean Louis created her gowns, however her many peignoir sets were almost entirely from the Lucie Ann Claire Sandra collection. You can tell that from the�two flowers on the bust. Also, Nolan Miller was credited as the costumer for Eva Gabor at some point, Nolan Miller was also the costumer for the series "Dynasty." Which episode had Lisa making the dehydroficated Mason Dixon Chicken Dinner? Episode 68, "A Kind Word for the President." Which episode did Haney sign a petition as Irving Two Smokes (a wooden indian)? Episode 66, "Oliver VS the Phone Company." Episode 69, "Don't Count Your Tomatoes Before They're Picked." What was Mr. Haney's license plate number? What were the words to Oliver's famous farmer speech? What is the manufacturer and pattern name of the china that Lisa uses? In what episode does Hooterville secede from the Union (By blowing up a bridge)? Why did Eb disappear from the show for a bunch of episodes while on his "honeymoon" only to return with no bride? Tom Lester had mono and had to miss several weeks of filming. In one episode, I think it was "Lisa's Vegetable Garden", Mr. Kimball shared a very interesting fact. He told Mr. Douglas something along the lines of, "Tomatoes are the dumbest of all vegetables. The average tomatoe's intelligence is less than that of a 6 year old child." If you could tell me the exact quote I would be very grateful. "Tomatoes are the dumbest of all plants. Well, their IQ is hardly above what a six year old child's is." Is Mr. Haney married? And if so, have we ever seen his wife? Yes, though we never actually see his wife, he mentions her several times throughout the series. In episode 11, Eb says that Mr. Haney has his marriage certificate on the wall and throws darts at it. Also, in episode 24 "The Ballad of Molly Turgis", when Oliver asks Mr. Haney if he'd ever seen an ugly hag when shaving (while Mr. Haney lived in the farm house...), Mr. Haney says "No, but my wife has...."
Eb Dawson once tried to win a contest on radio station WPIXL. To win, contestants had to identify 12 different songs. The prize for winning was a trip to what city and state? Which episode did Oliver have to take a number in the nonexistent line to talk to someone at the electric company? What make/model of vehicle did Hank Kimball drive? In episode 71 entitled "The Thing"... When they were trying to open the big crate to see what was in the box for Oliver's birthday, Lisa said something about what she had to find on the crate - a certain spot to hit - what was the phrase she used? what did she call the spot? I have wanted the bright colored picture in Lisa's New York apartment all my life. (The One with the bright squares and rectangles) Do you know anything about it or if there are copies somewhere? It is an abstract style of painting called "NEOPLASTICISM" and was made popular by a Dutch painter named Piet Mondrian (Do a google search on "Mondrian" and find TONS of info!) There's a fun website where you can create your own Mondrian! Click here. When was the fife music actually FIRST introduced on the show? In the earlier episodes Mr. Douglas' speeches were dry without the background music of a flute. 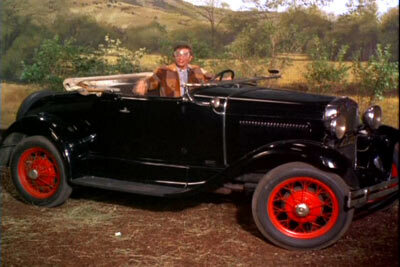 Do you know what model of Ford convertible automobile Mr.Douglas drives in the show? The first car used in the filming was a 1965 Lincoln Continental convertible, the second car was a 1967 Lincoln Continental convertible and the third car was a 1969 Mercury Marquis convertible. Here's a bunch of car info. In what episode does Lisa say "shoosting star"? From what I remember they are in the corn field, looking for shooting stars, and Lisa calls out that she has spotted a "shoosting star." I was wondering if you happened to recall which episode Eb sticks his head in a freezer and his eyebrows become white with frost? Where was the real "county seat" (capital) building located? (the small domed courthouse with the palm tree beside it). 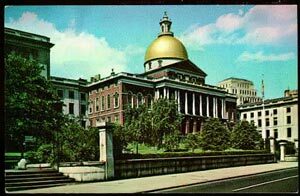 In an AMAZING feat of Detective Work, super-fan David Wisley has determined that the building is actually the Massachusetts State Capital building. What is the Douglas' License Plate Number? The license plate number on the Douglas' car is 4G-8561 (New York plates). Special thanks to Frank D'Agostino for this tid bit of information. 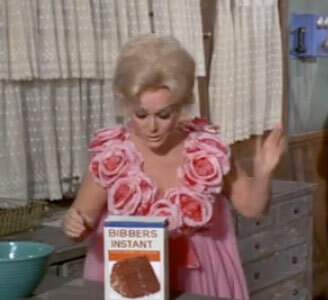 There was a Green Acres episode where Eb went on the road with a Country/ Western Singer. The singer was on the "Connubial Lable" (this name made my Mom laugh) and his "hit" song was "The Ace Of Spades". What episode? What was the singers name? I've looked through the episode guide and can find no mention of it. I saw the episode once when it first aired. I've never seen it re-run. Since he felt he owed Eb for being such a good friend, he offers Eb a job "plugging" his music...Eb travels all around the country with him, but becomes disgruntled with his job as it turns out all he is doing is "plugging" in all of the instruments before a gig. The job ends when Eb accidently plugs Tadpole (who is A/C) into D/C and blows out all the instruments and three of Tadpole's fillings! Last night we saw the episode (93, I think) called Who is not going to the luau. Arnold wins a trip to Hawaii thanks to poi juice. What was the topping on the YUCK pizza? A YUCK pizza has the following toppings... chocolate chips, raisins, sardines, sour cream, sliced pickles, and cherries. What episode does Mr. Haney have a picture of a cow named �Beverly�. I think that episode also has Mr. Haney talking about a �mari-juana� and somehow I think it had to do with some kind of barrel. In addition Haney is toting around an abstract painting of a cow by "Pablum Picarasso" in Episode 154 - Oliver's double (first aired 12/01/70). Can you please give me the entire meal that came out of Dee Dees' dehydrated Mason Dixon Southern fried chicken dinner? It contained fried chicken, mashed potatoes, corn on the cob, and for dessert...apple pie.� Yum Yum! What's the name of the city near Hooterville they were always visiting? If anyone inquires about Pixley, the town people would have to drive into on the Green Acres show, the story goes as such. This was told to me by Eddie Albert himself. When and where did Green Acres originally air? What were the words on Oliver's Birthday card? And how about Arnold's? Happy Birthday, oh son o� mine, Hope this finds you well and fine, The joys you brought me all through life, Never any sorrow, never any strife, And now you�re married, and have a wife, Happy Birthday, oh son of mine. Oliver interrupts him at this point. Haney claims it�s written by Henry Wadsworth Longfellow. What was that speech Lisa told Ralph about getting married to Oliver? Something about getting her driver's license, but marrying Oliver because it was cheaper? Could you find that whole speech for me? "Mr. Douglas didn't know I was going to marry him until we went to the license bureau. He thought I was going to get a driver's license. But then I explained it to him that a driver's license costs $5, and the marriage license costs $2, so if he marries me, he'll save $3. And then, of course, I could drive his car." Can you tell me which episode has Eb talking to Oliver and Eb's mouth is not synched to his voice (voice comes too late, then he slaps himself and then its too early, then another slap and its synched and then asks Oliver for an aspirin because he has a headache)? Can you tell me which episode it is where the Monroe Brothers get "Carpentry by" credits and Oliver looks into the camera and yells "They don't get credits!!!"? I have been looking for a clip from an early episode, which I'm almost sure is from season 1. There is an episode that starts with Eb milking Eleanor (or maybe just walking near her) and he's humming the show's theme! Then he "sings" in a Lisa-like voice "Dahling I love you but give me Park Avenue." Do you know which show it's in? My guess is either #12, #26 or #28. #22 "The Day of Decision"
Which episode featured Arnold having a paper route and pulling a little red wagon with newspapers?. At the end of episode #33, Wings Over Hooterville, Oliver kisses Lisa and Lisa says something in Hungarian that Eb asks Oliver to translate (To which Oliver replies "Get your own Hungarian! "...What did she say? "You are not a good pilot, but I love you." Which episode did the young children hold up signs for their organization and get the acronym in the wrong order? Episode #84 - My Mother, the Countess-The children are from the Hooterville Young People�s Agricultural Society (HYPAS). They stand in the wrong order and cheer "Society � People's � Young � Hooterville � Agricultural!" In which episode was there a chicken that played a tiny piano? UPDATE: Episode 108 "Everywhere a Chick Chick" (1/8/69) Mr. Haney shows off a chick, Vera, that plays a tiny piano. Did Eva ever create a Lisa Douglas-style wig for her company? Although Eva created many wigs for her company Eva Gabor Wigs, which was a multi-million dollar business, she never created a Lisa Douglas style wig. What was the brand of the checkered coat that Eb always wore? Tom Lester still wears the ORIGINAL coat from the series at public appearances today! Unfortunately, there are no brand identification labels in the coat. All Tom knows for sure is that it was provided by Western Costume in LA. In which episode was the term "Serving Wrench" used? Which episode had Mr. Haney's showing off the mobile computer on his truck? In episode 125 - Four of Spades (first aired 11/08/69) after Eb left to plug songs for Tadpole Talbot, Mr. Haney says he will use the �services of the Haney Computatater� to find a new hired hand for Mr. Douglas. Haney explains, �My machine is a combination of an old computer and a new potato peeler. Hence�computatater.� We see Mr. Haney using a punch card, but we do not get to see the computatater itself. In episode 133 - Rest and Relaxation (first aired 01/10/70) Bob Cummings comes to the farm to relax. He takes Oliver's car for a drive and has a flat tire. Mr. Haney shows up to change it, but has to issue a Haney's Auto Club card...from the mobile computer on his truck. Which episode does Lisa, toward the beginning of the show, refer to the "Irish Settlers"? I recall an episode were Haney was trying to sell Oliver bushel baskets with fake bottoms that where used to smuggle marijuana Haney said. What episode might this may have been? What episode did Oliver fly to Washington D.C. with Arnold? It was the one where the plane they were flying in was a an old C-47 (DC-3) that had benches that ran down the inside length of the fuselage. At one point, Oliver said that he was flying with "a stupe, a jerk, and a pig who thinks he is the Red Baron." He also asked if the flight was sanctioned by the FAA." To which the other guy asked, "the who?" At the airport, Oliver looks at Ed, Mr. Kimball and Lisa and asks, "Well where's the rest of the group? You're the whole group! A nut, a ding-a-ling, and a pig that thinks he's the Red Baron?" The airline started flying "last week"
Can you tell me in which episode Lisa "made" raw schpaghetti? What episode had Oliver and Lisa going back to New York. Oliver is in big social demand and the women all want him to move back. As do his law partners. Then they go to party in Greenwich Village and it's so crowded, Lisa can't get in the door but Oliver can. She realizes she likes the country life now. The women mistake Oliver for "Mr. Cummings." His former partner says, "Oliver, have you thought of coming back to the firm and living here again?" Oliver enters a door to a crowded party and Lisa says, "What about me?" 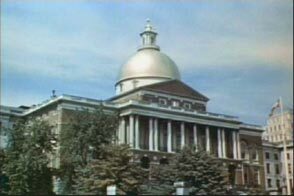 In episode 39 - The Good Old Days (first aired 11/02/66), a lot of stock footage was used to show events from the past. Unfortunately, no information about the stock footage was included in the credits, so we'll never know. Could you please tell me which episode had the Monroe Brothers splicing Sam Drucker's phone wires backwards, so he had to talk into the ear piece and listen through the mouth piece? In episode 131 - Beauty is skin deep (first aired 12/27/69)(TVLand #125). Lisa opens a "cosmetetical" business. Ralph Monroe saws a wooden plank while helping build an area in Drucker's Store for her to sell her products. Drucker: "Hello? Hello? What's the matter with this ding-blasted phone?" We learn that Ralph sawed through the phone wire. Ralph reassures him, "Don't get uptight. We're not gonna charge you for it." Later, after hundreds of cartons arrive from Lady Love Cosmetics at Druckers for Lisa, Mr. Drucker picks up the phone. "Hello Sarah? Get me...Hello? Hello?" "Those darn Monroe Brothers! They spliced the wires backwards!" "Hello. Sam Drucker. Get me the Douglas Farm." "I'm talking into the receiver and listening in the mouthpiece." Who designed all of Eva Gabor's outfits on the show? In season one, the designer was Jean Louis�afterwards it was Nolan Miller. Who is Arnold's favorite cowboy star? In the episode "Home is Where You Run Away From," Arnold says that it is Monty Blue. How many Christmas episodes did GREEN ACRES have? Was it just the one that starts with Oliver & Lisa buying a tree in New York? And what other holiday episodes were there? In the 1965 show, Lisa goes out wearing a short-sleeved skirt. Oliver dresses in red vest). No Christmas tree. The 1966 episode is, of course, devoted to Christmas. Harry is selling Christmas trees in New York. Oliver, however, prefers to have an old-fashioned Christmas. Lisa says, "It's 81 degrees, and snowing in New York. They're skiing on Park Avenue!" The 1967 episode, Lisa wears a red sleeveless dress to Drucker's Store. She wears a green house dress and green earrings. Oliver wears a green vest. Then they go on a picnic and Lisa is seen wearing white sunglasses to block the sun. No Christmas tree. The 1969 episode, Lisa opens a "cosmetetical" business. She wears a short yellow dress wwhen she goes outside. No Christmas tree. Do you know what episode contains references to a "Koskioski" (Maybe "Koskiusco" day? I remember it starts with Oliver wanting to go into Drucker's store, Lisa tells him it is closed because it is a Holiday- Koskioski Day- some Hungarian hero?? Much later in the episode he goes to town but Sam can't sell him what he wants because of the holiday. #88 The Hungarian Curse (first aired 03/13/68). Lazlo, who had saved Lisa's uncle by hiding him in a wine barrel during the war, shows up to "collect" on the "debt" by asking for a job. He bunks with Eb and the next day neither Eb or Lazlo will work because it's Koskioski day. Oliver tries to send Lazlo home but the Cannonball isn't running because it's a holiday. Lisa uses sauerkraut juice to make the hot cakes in celebration of Koskioski day, too. In what episode does Lisa appear in a completely different dress within the same scene? There was obviously some technical difficulty with it failing to cover her anatomy a la 1960's and she's just standing there and suddenly is in a different dress. In #45 "An old-fashioned Christmas" (first aired 12/21/66) towards the end of the episode, Lisa is wearing a bright red dress. Her right shoulder sleeve has fallen down. Lisa watches as Olvier lights their Christmas tree. "It's beautiful, darling!" she says. Then in the very next shot her right sleeve is back above her shoulder. And the Ziffels are at the door. What breed of cow was Eleanor? in Episode #81: How to Succeed on TV Without Really Trying, Dilly has programmed the "electronificated" barn door opener to respond to the moo of a Guernsey cow (Eleanor). And, the actual cow does appear to be a Guernsey. What breed of chicken were Bertram and Alice? Do you know the name of the episode in which Lisa is cleaning her ring and saying HA, over and over? This is from the third season, episode #64, �Lisa�s Jam Session�. While Oliver and Eb are playing chess, Lisa is sitting on the couch, blowing on a diamond bracelet and polishing it with a toothbrush. (She points out that you always get more money for clean diamonds in a prawn shop.) Lisa would never be caught wearing silicone bracelets or wristbands as part of her jewelry ensemble. She is definitely a diamond bracelet girl, who would probably just toss out a silicone bracelet if she was ever given one at a charity event. What episode was Mr Haney trying to sell Oliver a horse and was singing, �There�s a traffic jam on the Chisolm Trail tonight, Martha�. And then later, �It�s so lonely in the saddle since my horse died�? I believe there are two episodes mixed up here. Haney was trying to sell Oliver a horse in the episode "The Birthday Gift". He wanted to buy one for Lisa's birthday and ended up with Haney's talking horse. The episode where Haney was riding the horse and singing about the Chisholm trail was "A Husband For Eleanor". Haney was "herding" the little bull named "Ole" (Olay) when he was singing this song. Trying to remember an episode in which every so often the camera would show a cute little mouse sticking its head out of its mouse hole. Finally, it slammed the door of said mouse hole! Which episode was it? This was Episode #150 "The Great Mayoralty Campaign", from the sixth season. Towards the end of the episode, Oliver and Lisa have a big argument about the dirty campaign tactics, and Oliver gets mad and storms out the front door, slamming it behind him. Lisa says, "Bad riddance to good rubbish", and goes into the bedroom, slamming the door behind her. Then the mouse goes behind his mouse hole door, and slams it shut. Also, at the end of the episode, Ralph Monroe is riding on the horse, wearing a long blonde wig (like Lady Godiva), and we again see the mouse slam his door shut! Which episode is Mr. Douglas & Eb playing chess and he keeps calling the pawns - prawns, and Mr. Douglas goes ape? This is from the third season, episode #64, �Lisa�s Jam Session�. There was an episode where Lisa had a part needed for the car or something of the kind where everyone seemed to know what this thing was, and I just can't remember what it was called, but it was something like a flapdoodle skewer???????? Does this ring any bells with you? Additional info: The name of the episodes escapes me right now but it was Oliver that was working on the tractor and noticed that there was a part missing. A long rod about so long. Lisa had taken it off the tractor to make "hots kabobs" and was using it for a skewer. When Oliver went to Drucker's and asked if he could buy the part for the tractor Mr. Drucker said he couldn't help him. The only thing he had that sounded like what Oliver was looking for was a hot cake skewer. It ended up being exactly what he was looking for. Episode 48 - His Honor (first aired 01/11/67) . Lisa used a connecting rod to Oliver's tractor. What she called it was a "hots kabob skewer". Who said to Oliver about Lisa, "You either get a looker or a cooker," and which episode? Episode 49 - It's so peaceful in the country (first aired 01/18/67): Oliver's mother comes to Hooterville to rest only to find that a tribe of Indians is having their annual powwow on the farm. The chief refuses to leave unless he can have Oliver's mother for his squaw. They have him test Lisa's hot cakes, which they indicate Oliver's mother made. He says, "Old squaw good looker, but rotten cooker." In addition...Mr. Wheeler says that EXACT quote to Mr. Douglas in episode 153, Enterprising Eb (first aired 11/24/70). Can you tell me what make/model and year of the car that Eb bought in "Not Guilty" was? Click here for all the information you could possibly need to know about Eb's 1930 Ford Model A Standard Roadster. I�m trying to figure out which episode includes Lisa making a cake from a mix. I seem to remember that she put all of the ingredients in a box, and then put the box in the oven. The company slogan was something like �you can�t make a boo-boo with bibbers.� Can�t seem to find this one. I was just wondering about an episode with a picture of the Beverly Hillbillies that that lit up when Oliver would turn off the bedroom light ? I know most of these episodes and which ones they were. This one I can't find or remember. Thanks for any help. I remember a scene from a long time ago that intrigued me. I remember Eb came running home to talk to Oliver about something, the are outside and Eb runs in the house with Oliver following, the Eb comes is back outside and comes running in the door again, then Oliver goes out side and Eb comes out of the house again, this goes on a few minutes and the running gag is Eb keeps getting in and out of the house some way. Would you happen to know what episode that scene is from? There may be other episodes as well, but it happens once at the beginning of Episode #111, Economy flight to Washington (first aired 02/12/69), and much longer in episode 155, The high cost of loving (first aired 12/08/70). Would you know of what brand name and the proper style name of the hat that Oliver Douglas always wore? It always had a little feather pin in it. According to the TheFedoraLounge.com, because the hat has a rope type band, instead of a ribbon, it is a Tyrolean style hat. In the episode "Horse? What horse?" the doctor called in to check out Oliver is impressed by paintings in the Douglas farm. They are a Matisse, a Gauguin, a Renoir "and a small Rembrandt in the bathroom". 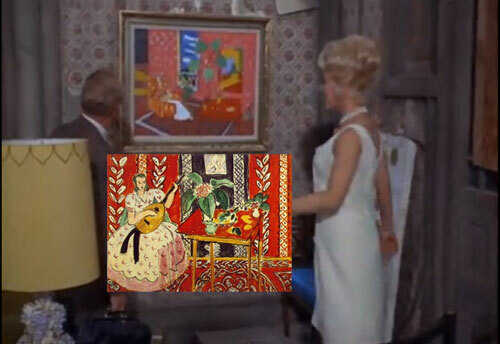 The paintings in the living room, are they REALLY prints of existing Matisse, Gauguin, and Renoir paintings, or just studio props very cleverly painted in their styles? I noticed that the Mondrian might not be a Mondrian at all but a painting in that style. Was wondering about the other paintings. Would you know which episode Lisa said this: Sometimes a women wonders why I married him why does it happen so often. That would be "Charlie, Homer, and Natasha" (aired 12/22/70). Click here to view the episode. Do you recall off-hand what episode is was that Lisa Douglas referred to the booze Oliver kept on hand for "municipal porpoises? Oliver: How come we haven't seen Arnold? Lisa: Oh he is rehearsing for a play where he hopes to have a part. This was in the episode "A Star Named Arnold is Born" Part 2 (first aired 04/10/68), about 11 minutes in, and it's in reference to Arnold's "scream test". People often ask the if the cast members ever had any legal issues. Most of the cast members never had issues and did not need a criminal attorney to help out.